Last Week in Review: Job growth in November came in far above expectations. How did the markets and home loan rates react? Forecast for the Week: The second half of the week heats up with news on wholesale inflation, jobless claims, consumer spending and consumer sentiment. View: Find out why HARD Goals can be the secret to getting from where you are to where you want to be. "Start me up." The Rolling Stones. The labor sector has kicked into high gear, with job growth in November far exceeding expectations. The November Jobs Report showed that 321,000 jobs were created, far above the 230,000 expected. In addition, 44,000 jobs were added to September's and October's figures. This report marks the tenth straight month of 200,000 plus job growth, which is the longest stretch since 1994.Another positive in the report is that the Unemployment Rate held steady at 5.8 percent. However, there is one thing to watch in future months: Hourly Earnings came in double expectations. If future months show this is the start of a trend, inflation talk could heat up. Remember that inflation is bad for Bonds, as it reduces the value of fixed investments like Bonds. This means inflation can also cause home loan rates to worsen, as they are tied to Mortgage Bonds. 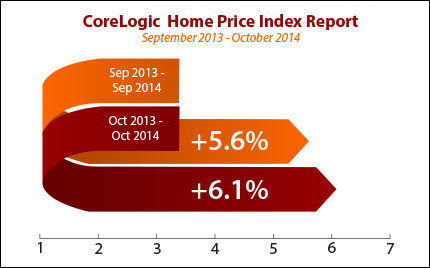 But the main takeaway is that the labor market and overall economy continue to improve, and these improvements should provide a boost to the housing market.Speaking of housing, research firm CoreLogic reported that home prices (including distressed sales) rose by 6.1 percent from October 2013 to October 2014. This is up from the 5.6 percent annual gain recorded in September, halting a seven-month slowdown. Home price gains are at more normal levels now, after the double digit gains seen earlier in the year. Even though the strong Jobs Report caused volatility in the markets, home loan rates remain near some of their best levels of the year, and now is a great time to consider a home purchase or refinance. Let me know if I can answer any questions at all for you or your clients. Economic reports don't begin until Thursday, with the end of the week bringing key reports. On Thursday, look for Weekly Initial Jobless Claims as well as November's Retail Sales. On Friday, the Producer Price Index will reveal if there are inflation pressures at the wholesale level. Also on Friday, the Consumer Sentiment Index for December will be released. As you can see in the chart below, Mortgage Bonds declined in recent days but home loan rates remain near 18-month lows. Heartfelt: You're emotionally attached to it. Animated: You've got a vision of its accomplishment. Required: You feel such a sense of urgency that you must act now. Difficult: You must be challenged by it. The goal is totally within your comfort zone, and feels easy. The goal is "pretty much" within your comfort zone, but not exciting. The goal is a little outside your comfort zone, and makes you nervous. The goal is definitely outside your comfort zone, and makes you uncomfortable. The goal is way outside your comfort zone, and causes anxiety. While No. 1 Goals are probably only items on your daily to-do list, and No. 5 Goals are probably those you aren't meant to achieve, it's the No. 4 Goals you should pay the most attention to. Goals that take you into uncharted territory but don't leave you paralyzed by anxiety are the ones that will give you the most challenge and satisfaction. Try this simple analysis of your goals and see! Please feel free to pass these great goal-setting tips along to your team, clients and colleagues!